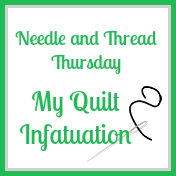 You may recall that I participated in the New Quilt Bloggers Blog Hop back in June and July that was hosted by: Stephanie @Late Night Quilter, Cheryl @Meadow Mist Designs, Yvonne @Quilting Jetgirl, and Terri Ann @Childlike Fascination. So design a block and write a tutorial...piece of cake...ummm...not so much. I welcomed the opportunity to kick start my creative thoughts, but then reality hit, as well as the panic of having to design a block. Finally, I took inspiration from a floor tile I found online. All the quilt blocks made will be sent to Cheryl, Stephanie, and Yvonne, who will make a finished quilt to be donated to charity. Stay tuned for all the blocks, with tutorials. 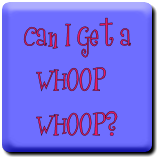 The blog hop runs August 31 to September 3. 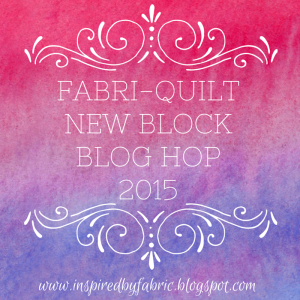 My block and tutorial will be posted on September 3. TGIFF!!! A Friday Finish, which is also my August goal for A Lovely Year of Finishes. My goal was to piece and complete a Plus Quilt. Goal achieved! Kona: Baby Blue, Curry, Cappuccino, Pistachio, Raffia, and School Bus. There were some leftover squares, so I made a small baby quilt. 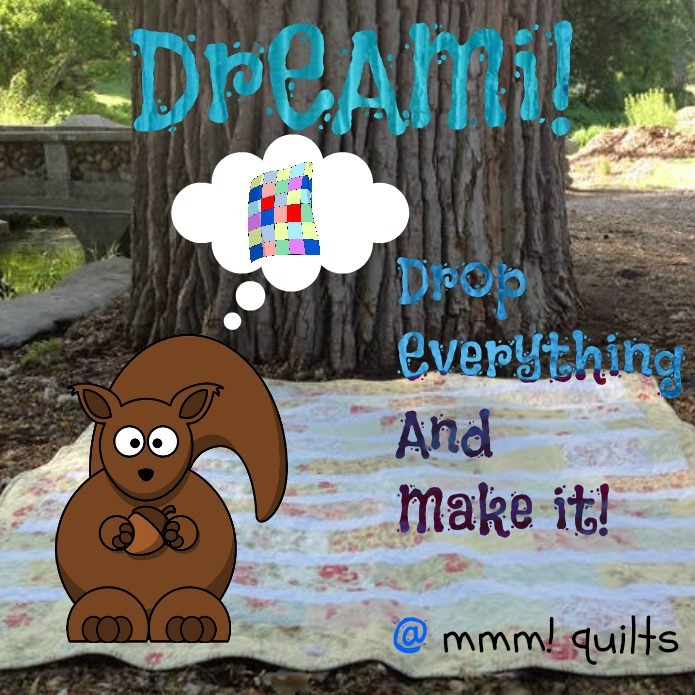 Sewing begin in August for the Midnight Mystery Quilt hosted by Cheryl over at Meadow Mist Designs. Flying geese...one of my least favourite things to make. I know how to make them, but they never seem to turn out correctly. Cheryl provided instructions for a no-waste method. 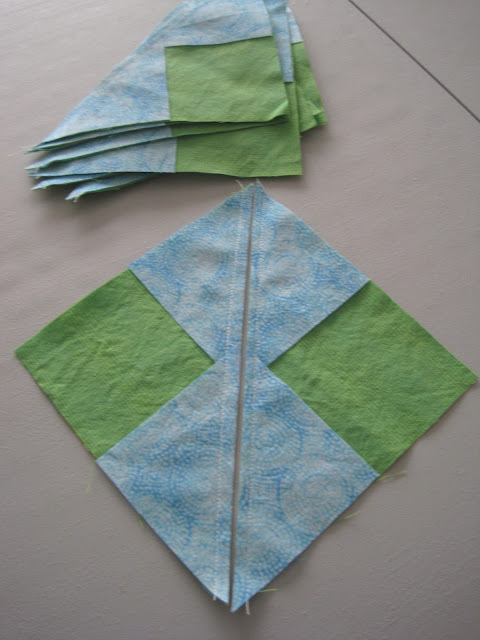 First you sew two small squares on opposite corners of the larger square (sew on both sides of the marked line). You then slice the block down the middle on the diagonal line. And then sew another small square on the corner of each of the halves. Cut again on the marked line, and voila...four flying geese from the original large square. It's not too late to participate if you want to join the fun. There are new instructions each month, so there is plenty of time to complete each step. I still haven't cheated and asked to see the final design. I wonder what September's instructions will be. 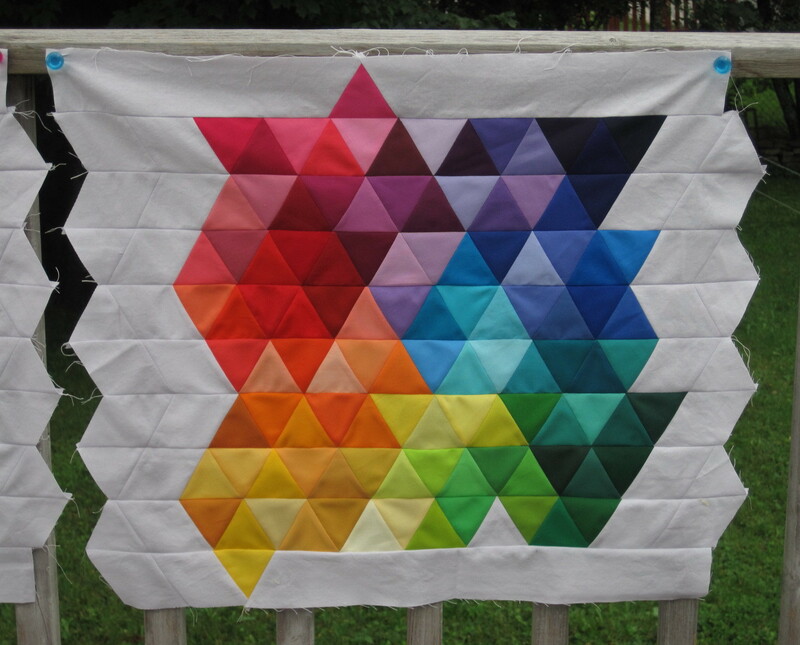 Tessa over at Half Square Quilts is hosting a monthly 18-inch finished block swap. I have seen many online swaps and thought I'd give it a try. 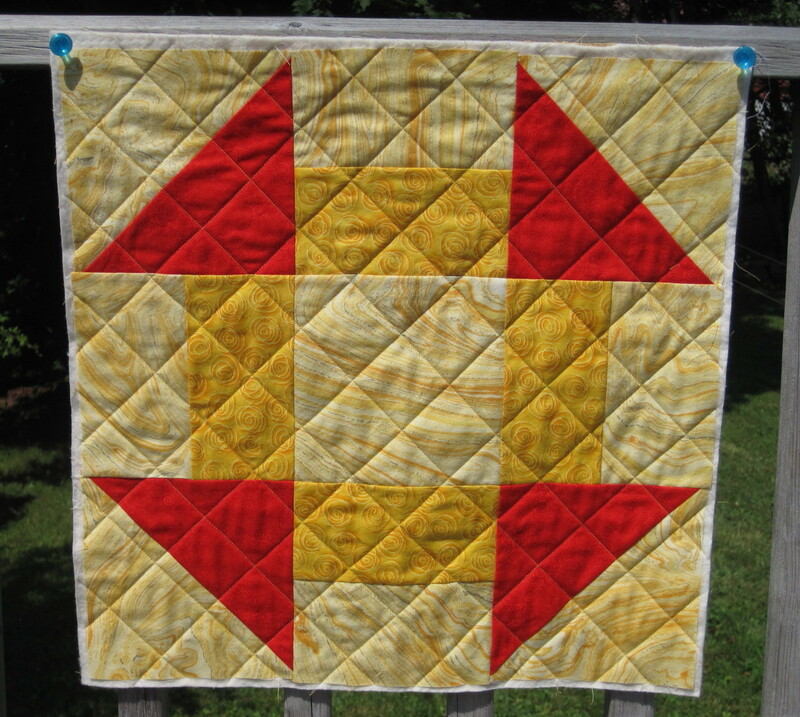 My partner for the month of August is from Texas, and she requested reds and golds for her fabric choices. 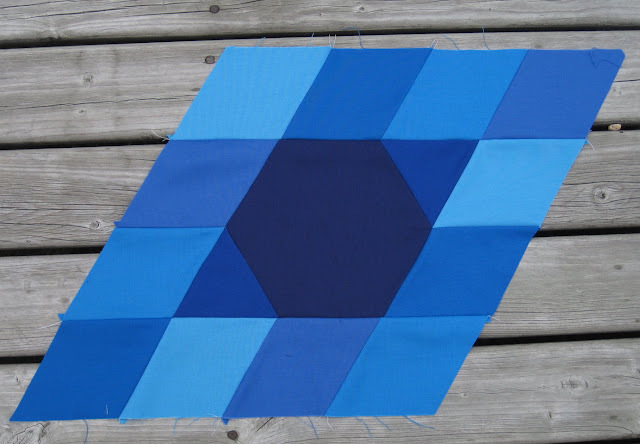 It took a long time to find an online pattern/tutorial that had the measurements for an 18-inch finished block, but I finally found it over at Delaware Quilts. 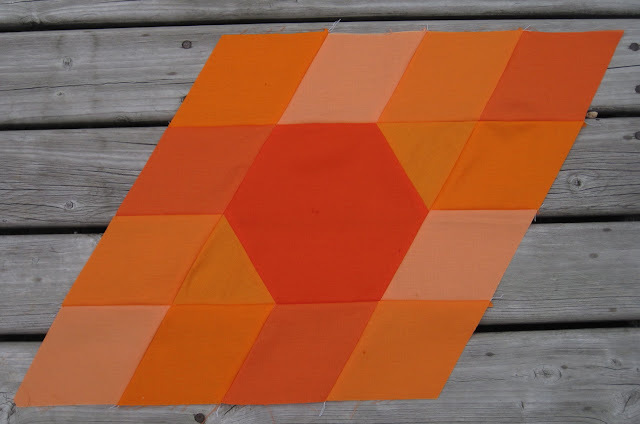 I've decided not to continue with this swap as the expectation is that your partner shows you the fabrics she has chosen to make your block and the pattern she will be using. And you receive a photo of the finished block before you actual receive it. I don't see the fun in that. 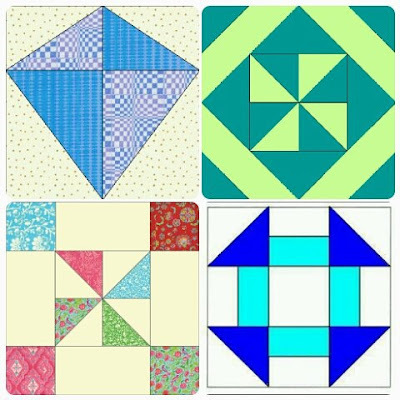 If I'm choosing the fabrics and the pattern and then I see the block before it arrives, then I might as well have made the block myself. Where's the surprise? Maybe I'll try a different swap in the future. I'll definitely ensure that I understand the expectations before signing up. Have you tried a swap? What was your experience? 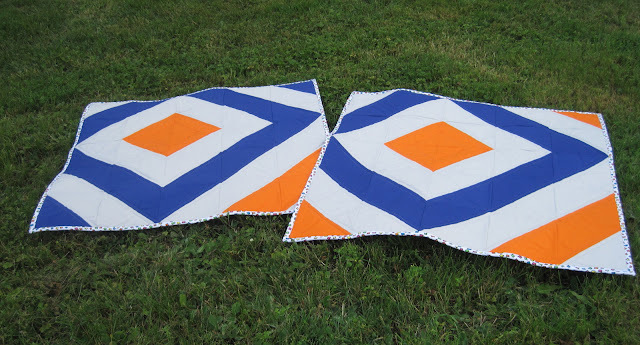 I have this habit of making quilt tops and then putting them away before they are quilted. 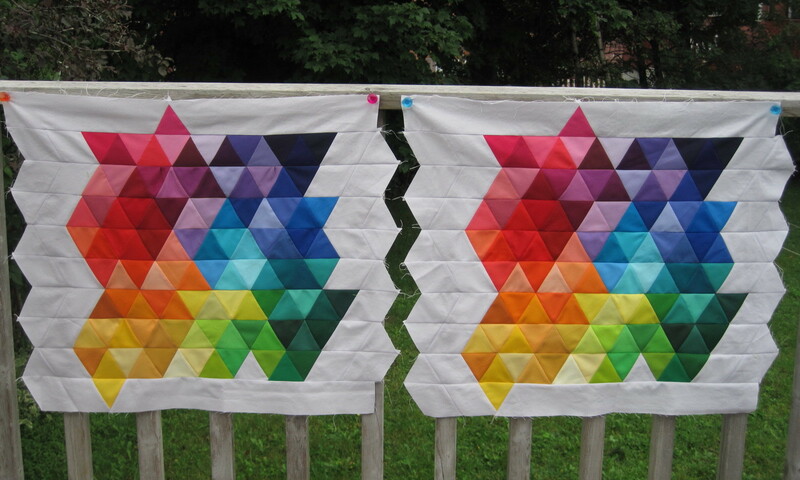 Piecing is my favourite part of quilting, the actual quilting not so much. There are so many patterns I want to try -- I just keep making tops...and more tops...and more tops. I finished two baby quilts that are destined for our local children's hospital. These tops were pieced back in May, but they were put away and forgotten about. 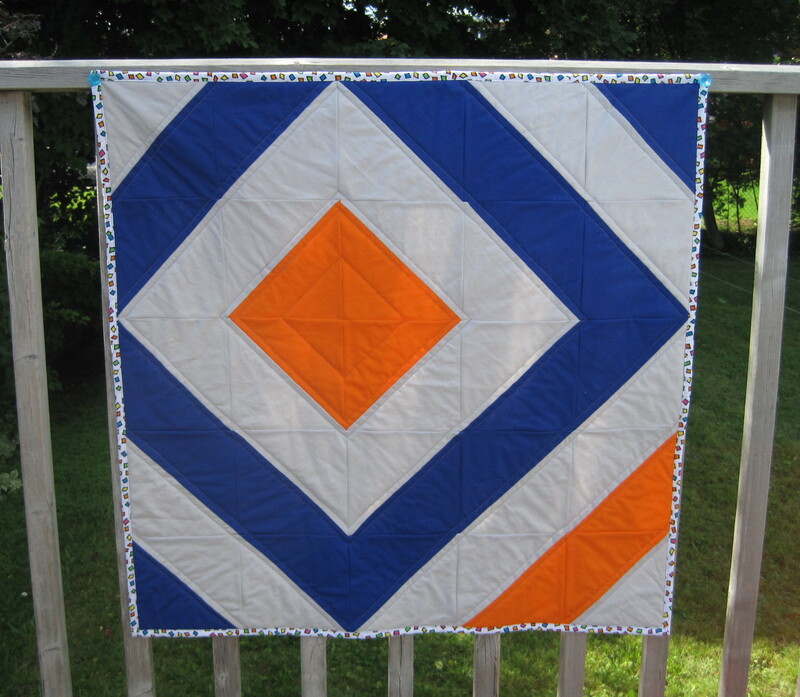 The HST's were made from the cut-off corners from this commissioned quilt. The Gravity QAL is coming to an end. 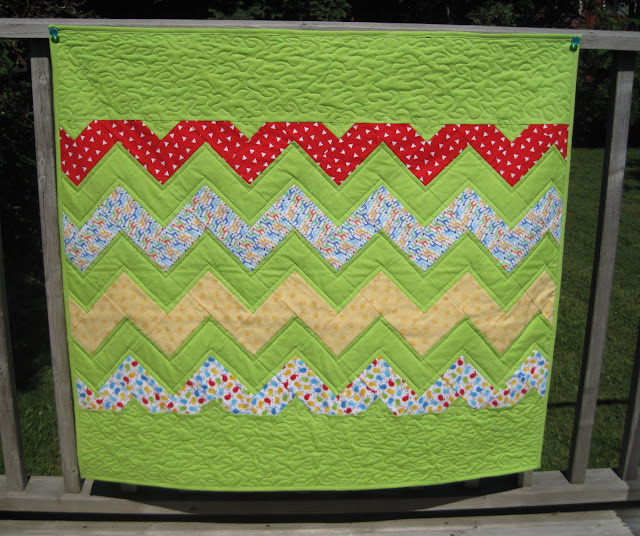 Quilt tops will be showcased the first week of September. The link up for finished quilts runs from September 18 to November 20. 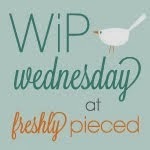 Here are the background sections which will be pieced with the 18 blocks (two colour ways of each block). 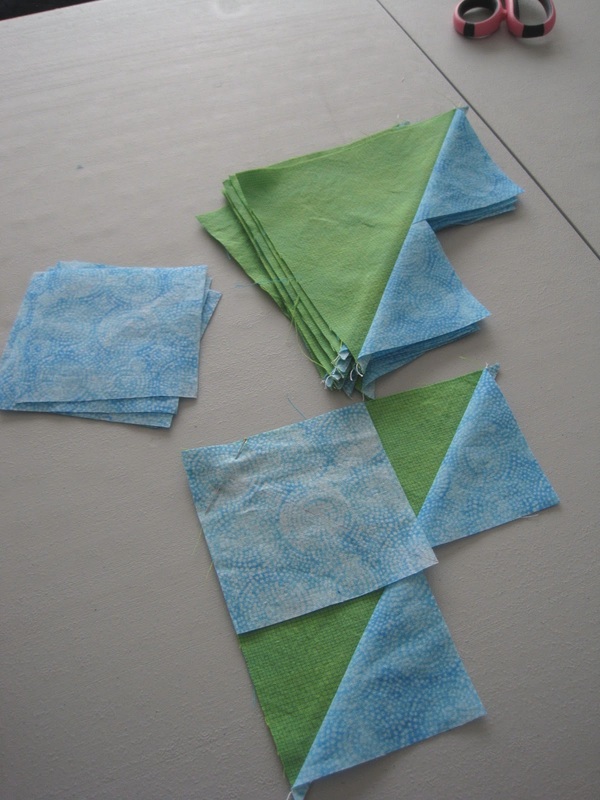 Not very colourful, but these are integral to piecing the top together. I seem to be missing a photo of the Triangle pieces. 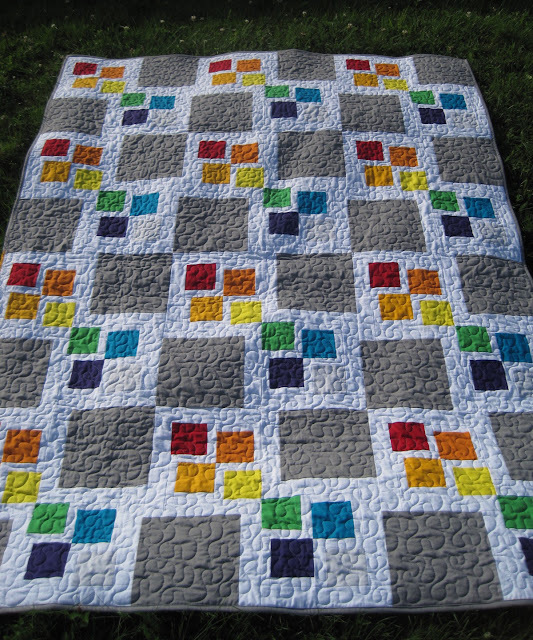 The next post you read about Gravity will be a finished quilt top. It's been a fun adventure! 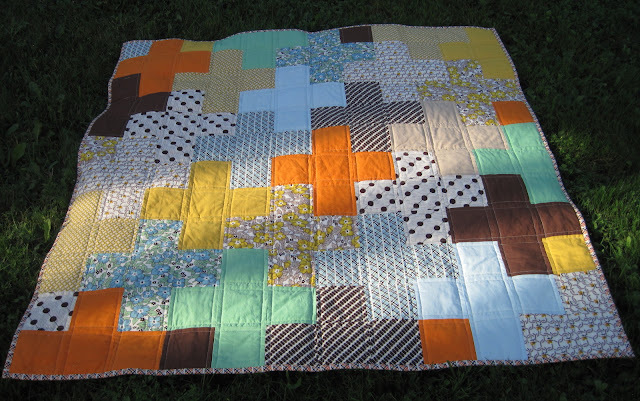 Celebrating a Friday Finish with a commissioned baby quilt. 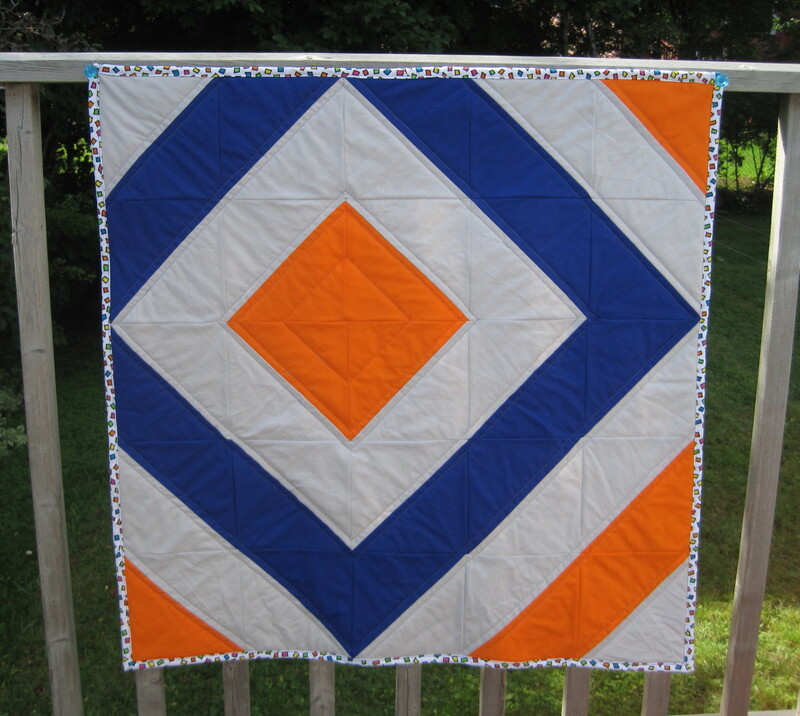 The customer wanted the same quilt as I had previously made. I love a quick finish project. 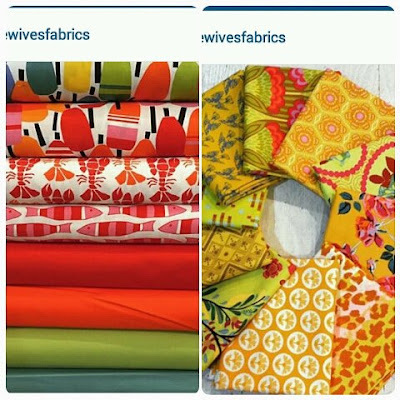 The customer once again picked out the fabrics, including Kona Sprout. Since I have been improving my skills on the longarm, FMQ on my little Singer feels awkward and more challenging. Have to make sure I continue to practice on the Singer as well. The recent Gravity madness continued during a Q-Squared sew day. I love getting together with the Squares for a day of sewing and good conversation. And of course going out for lunch and taking a trip to the LQS. Matching pillows for my Gravity quilt. 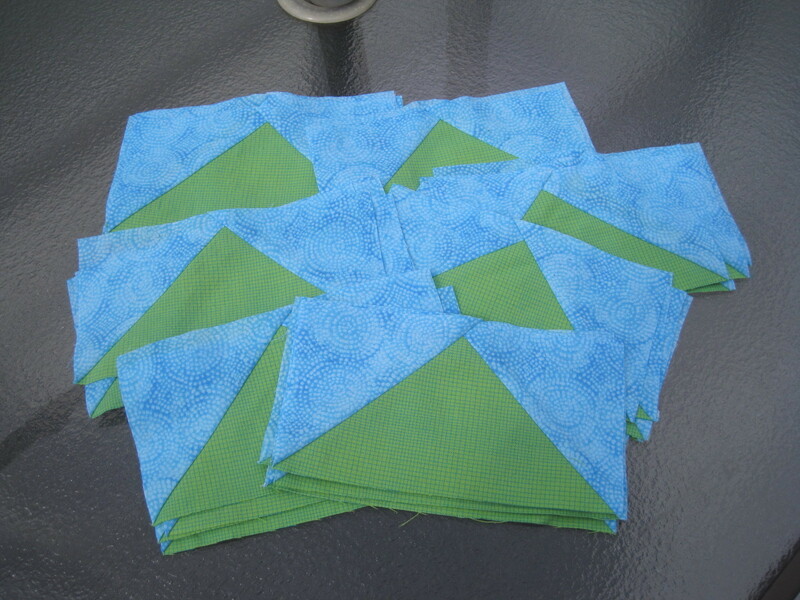 I need to square these up and decide how to quilt them. Also have to decide what to use for backing fabric -- as well as backing fabric for the Gravity quilt. 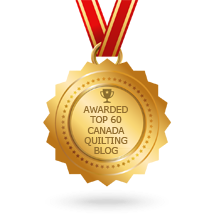 Recently, a friend asked if would consider donating a quilt for a raffle for fundraising efforts for the Canadian Breast Cancer Foundation Run for the Cure. 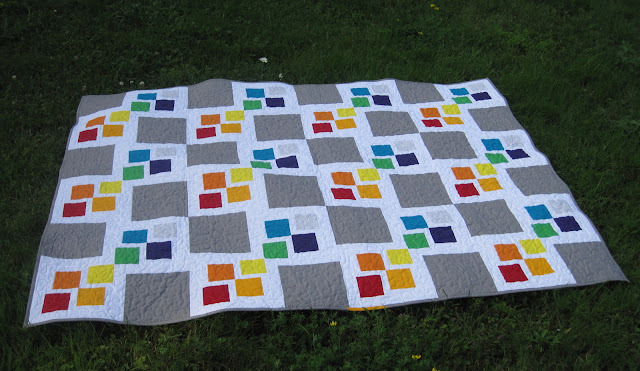 Since this Gray Square Scramble quilt had no destination (having been sitting in my sewing room for far too long -- last year and this year), I thought it would be a good quilt to donate. 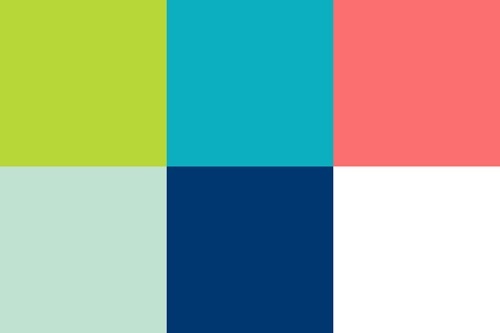 Several Kona colours are being crossed off the list: Pewter, Papaya, Orange, Citrus, Cyan, Rich Red, Silver, Kiwi, and Purple. Now that the mystery of my longarm woes are solved, I'm getting lots of practice with my FMQ skills. I know there was a better way to quilt this, but I had no ideas on how to quilt it. 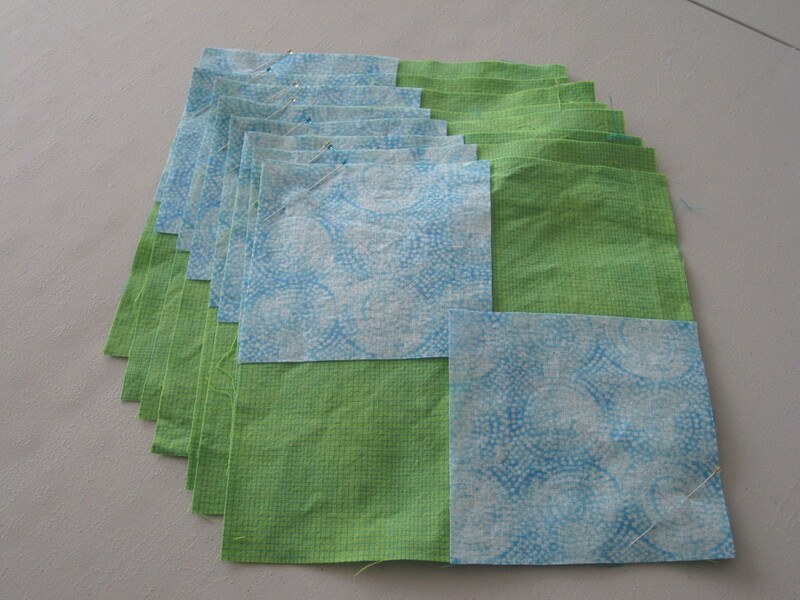 And since it was needed right away for the raffle, I had to do some quick quilting. I was surprised on how well the stippling looked in the end. 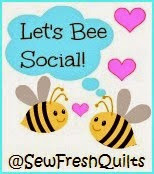 My goal is getting quilts finished and out the door. 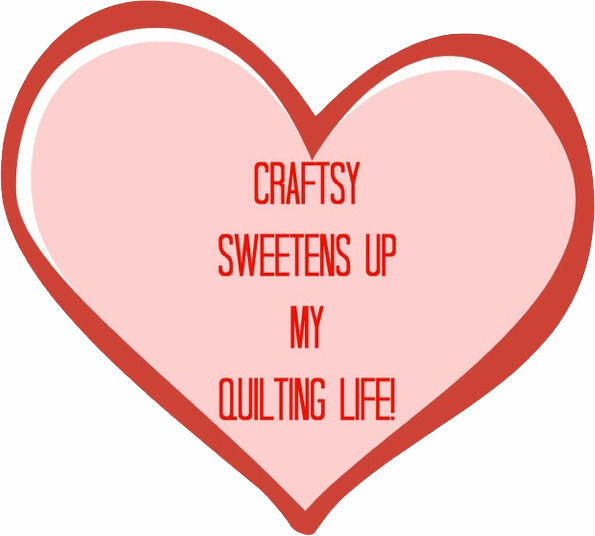 And if that means easy quilting, then so be it. 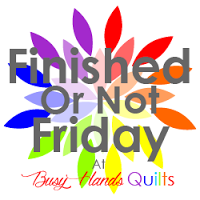 Finish is better than sitting in my sewing room. 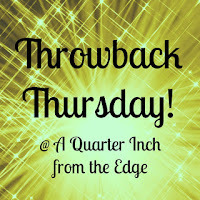 My friend Jenn @ A Quarter Inch from the Edge has taken up the challenge and created a new link party. 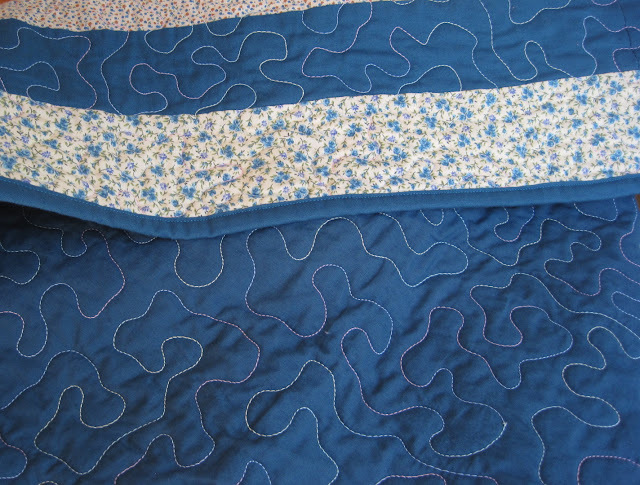 Once a month, you have the opportunity to showcase an older quilt. 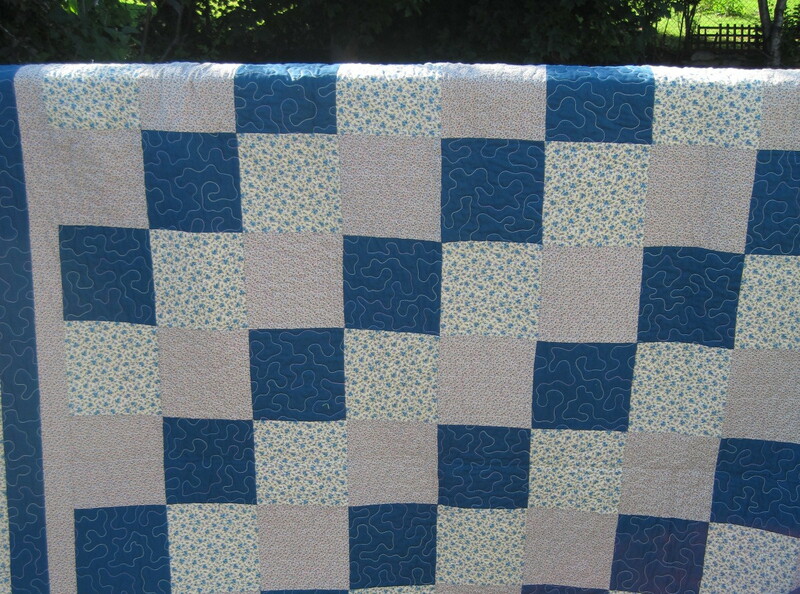 This is one of my very first quilts -- squares with borders was the project of choice as I was learning to quilt. Although this quilt has been finished for many years, it has just been sitting in the pile of quilts without a home. 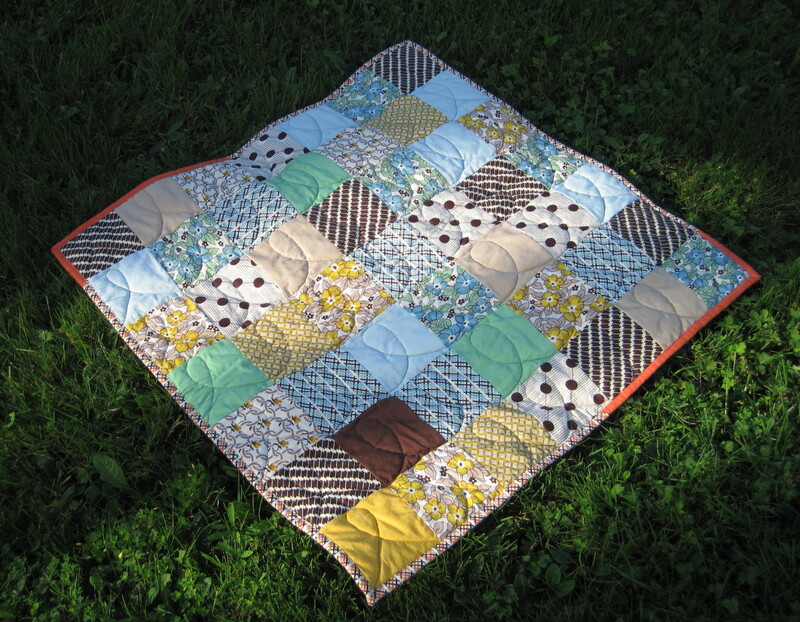 But finally this week, it went to its forever home -- with my friend T.
I splurged and had it quilted at Mira Stitch N Post. The prices were very reasonable, so thought I would give it a try. I hadn't learned about free motion quilting yet, and stitch in the ditch was all that I knew. The variegated thread made me happy. 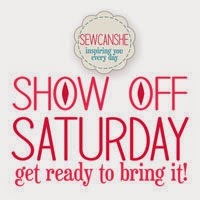 Although Nova Scotia is a small province, it's a five-hour drive to Mira Stitch 'N Post. A Girl Guide friend told me about this local shop, and so when she was in town for a Guiding meeting, she took my quilt back home with her and delivered it to the quilt shop. And so began the various adventures that my quilts went on to be delivered to Mira Stitch 'N Post. If memory serves, the most complicated journey was: a co-worker (our office is in central Nova Scotia) took a quilt to a work event (in western Nova Scotia) to be delivered to another co-worker (whose office was in Cape Breton - east) to be delivered to a Girl Guide friend who worked at a local copy shop next to the office, who then delivered the quilt to the quilt shop. 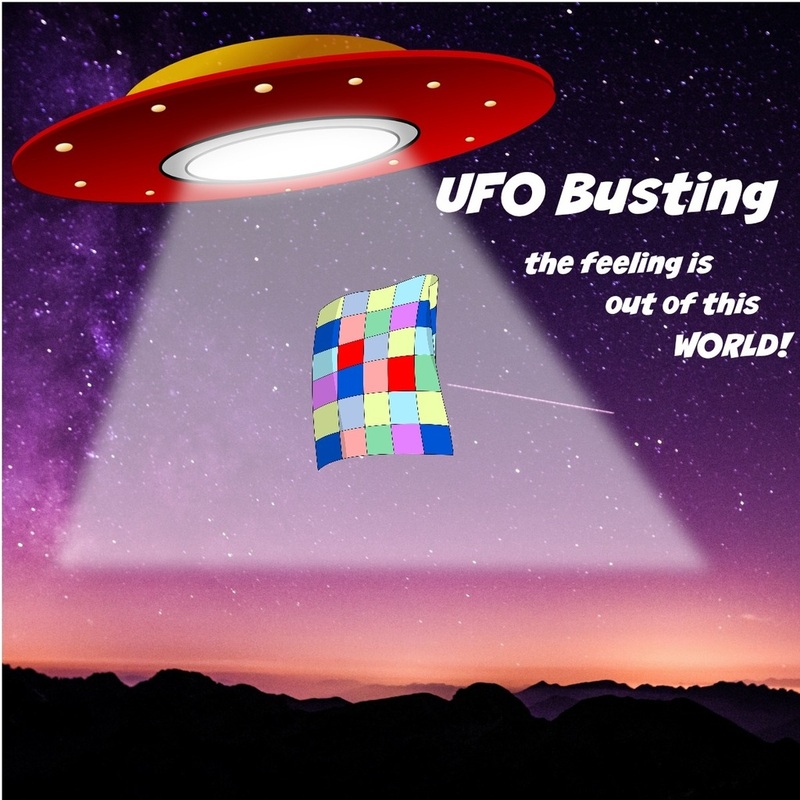 I was trying to save shipping costs, and it became quite fun to see how I could get a quilt delivered through my friends. 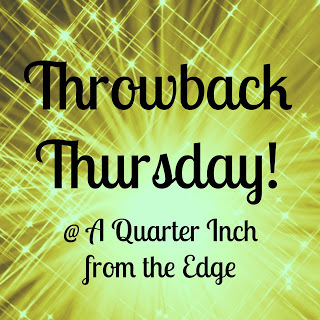 I hope you join in with Throwback Thursday. 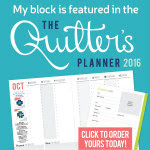 It's a great way to showcase all the pre-blog quilts we've made, and it's a great journey down memory lane. The end is in sight. It's hard to believe it's only been three months since my Gravity adventure began. Myra @ Busy Hands Quilts did a great job organizing and hosting this QAL. The schedule of two weeks to complete each block was the right amount of time. Not too long of a period that I'd procrastinate, and not too short that I was scrambling to get the blocks done. Here's Block 9 - Voyage. I have been wanting to make a Plus quilt for some time. 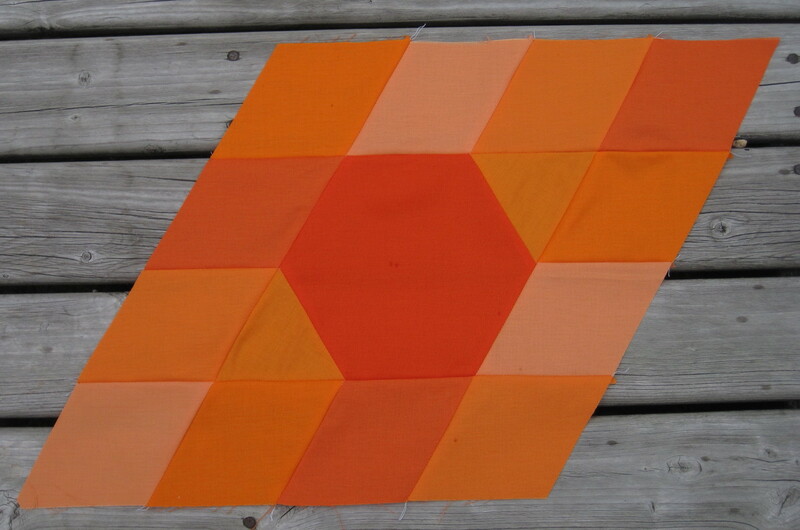 I keep seeing Adrienne @ Chezzetcook Modern Quilts make them, so I figured it was time to try it. 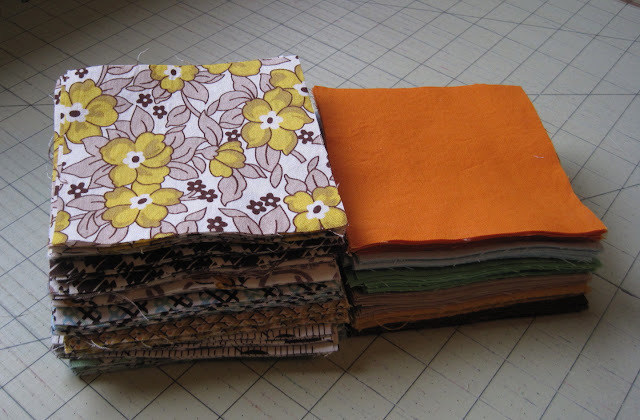 I won a Denyse Schmidt fat quarter bundle at a MMQG meeting. I added some Kona to the mix: School Bus, Curry, Cappuccino, Pistachio, Baby Blue, and Raffia. Chain piecing is the way to go. My goal for August is to piece and quilt this Plus quilt.